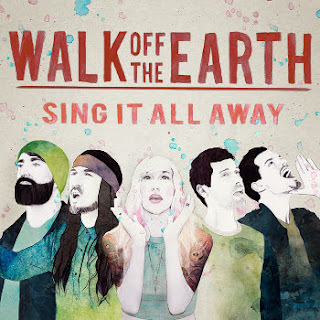 When the format of DIY hit with Walk Off the Earth's cover of Gote's song- “Somebody I Used to Know,” the flow of creative, unique expression gave way to one of today's most sought after bands. Captivating the YouTube market and garnering over half a billion views and two million subscribers... being signed to Columbia (Sony) Records and WOTE's sophomore album release, hey maybe there is something to this 21st Century marketing of DIY music after all! Ryan Marshall: A quick and a fun one! SR: I have to ask, is there a correlation between pro creating humans and pro creating albums? They seem to be simultaneously happening. As with the album, R.E.V.O., there was the first child born to Sarah and Gianni's and now around the time of this next album there is another little bundle making its debut. RM: (laughed) Our newest album just came out, so whatever happened 9 months before that... there must be something happening. But, um yeah you're right... they (Sarah and Gianni) are just always close to one another. SR: Well, yes they kind of have to be in order for that to happen. It was just something humorous I had noticed with these two albums. Actually, you all seem like you're a very close group of friends, it shows in your work and on stage. With the amount and intensity level of work you all do as a band, do you also hang out together outside of band life? RM: Yeah, well we are all friends. I think what a lot of people notice is that we all love music. That is something genuine, and when people come to the show they see that connection between us. SR: Take us back a few years, how the band come together? RM: 2005 Gianni and I got together, and we started the project. We did the Warped Tours, toured a lot, did a couple of albums as an indie band does. We reached a point where we didn't want to drive around in a white crappy van anymore and drive across Canada, so we needed to find a way to reach an audience. That is just when YouTube was taking off... we could put up a couple of videos and Sarah had a solo project and Gianni was producing Sara's solo project, as she was just in the studio all the time and she just started doing videos with us. Then we met Taylor through some family friends, and Joel came along so there was just this kind of point where Sarah was busy still with her projects, but Walk Off was becoming busier and we were doing so many videos... really it just kind of happened. I couldn’t give you a date or a reason, it just kind of happened. SR: You had mentioned back at the beginning that you and Gianni were working on a project, can you describe what you mean by a project? As it seems to me WOTE is a project with a message. RM: Yeah, well Gianni and I both had this vision of creating a band or a project and being a part of something that would allow people to get away from the everyday stuff... that is what we needed. We all worked jobs. That is where the name of the band came from, as in music that would let you walk off... we try to represent this within our videos, music, way of life. It wasn’t intentional, but it is a way of life. Our own escape. SR: For five people to come together and be harmonious is never easy. You all are like family, how do you work through challenges when they arise? RM: Yes, true we are family. Every part of our team is family, and we have tried to only let people into that circle who want to be a part of the family. The positive and happy, that is what gets us through anything. SR: What part of social media do you prefer using Marshall? RM: Twitter. I love the news-feeds, world news. I’m not so much on Facebook anymore, but that’s the great thing about having so many in the band. We each have our own outlets we like. Like Sarah and Gianni love Facebook. Me, though, I like Twitter and oh, I am not into the selfies and stuff either. SR: No selfies with your coffee cup then? RM: (laughed) no, no coffee selfies. SR: How do you balance the tour schedules and production with your family life Marshall? RM: I have a great family at home, we have a five-year old at home. The last few years have been so busy, you must have a great support system at home to keep going...which I do. SR: Now, it looks like the second half of your tour picks back up in Europe. RM: Yes. First we have a few dates here, then in October we head over to Europe. This will be our fourth time touring over in the UK/Europe. Our fans over there are incredible, we love them. SR: Is there anything you do outside of WOTE that you enjoy doing? RM: Songwriting, I love to write. WOTE obviously has thousands of songs, so you know you create a catalog of music. What's cool though as at one time song writing was just a hobby, but now I get to call it work (paused) which is just an incredible feeling. Oh, And I love sports...I’m a basketball fan, I try to play as much as I can. RM: Oh, I’m short so I just play point guard. SR: How's your three-point by the way? RM: I’m alright, I’m a pretty good shooter! SR: You all have just released your new album, “SING IT ALL AWAY." RM: Well, I think for us as the band we had the time to put into this album. It wasn't rushed, but we wanted to get it done to the response we were having on the internet to the band. We had two years of writing, producing... with 35 songs to choose from and we got it down to 11. The production just came together the way wanted it too. It's like a gigantic sing along. The way we do our live shows is we engage our crowd we wanted to do that with this album too. As the music is a lot of sing along chants, so there is the involvement. SR: Do you have a favorite song off the album? RM: We all love “Rule the World,” it was the right choice to get the feeling of the album. There is this song, “Hold On,” that just has some great background to it. I don't want to give away too much, I want people to create their own meaning for it. But there is a lyric in it, “it always greener on the other side,” it speaks to that there isn’t always something better on the other side and maybe what you're doing is where you need to be right now.